We finish this sermon series with a part of the Christmas story which is after the birth of Christ and before the arrival of the Magi, and we do this because this moment in human history is often missed and overlooked. On the 41st day of Christ’s life, after Mary’s purification period, Jesus is brought to the temple to be dedicated to God. Many may see this as a religious duty, but the reality is that this is the moment that Jesus who is OUR temple came to begin the transfer of power from the temple on earth to the Holy Temple who is Jesus Christ. The moment is confirmed by Simeon and Anna, but the point is clear that the adventures of God have a specific purpose that is stated clearly by these two prophets of God – to bring salvation, revelation, and glory to God through Israel toward all the world! Any adventure from God – will always have the same purpose – and requires the same realization! Praise be to God! A special Thank You to Wayne Mainor for reading his poetry as part of our service! The word “Advent” means “the beginning” and is traditionally used at Christmas time as we celebrate the First Advent of Jesus Christ. However, the beginning leads us to think of the next steps – in fact, the word “Adventure” means “a bold and hazardous journey that has no known outcome”. 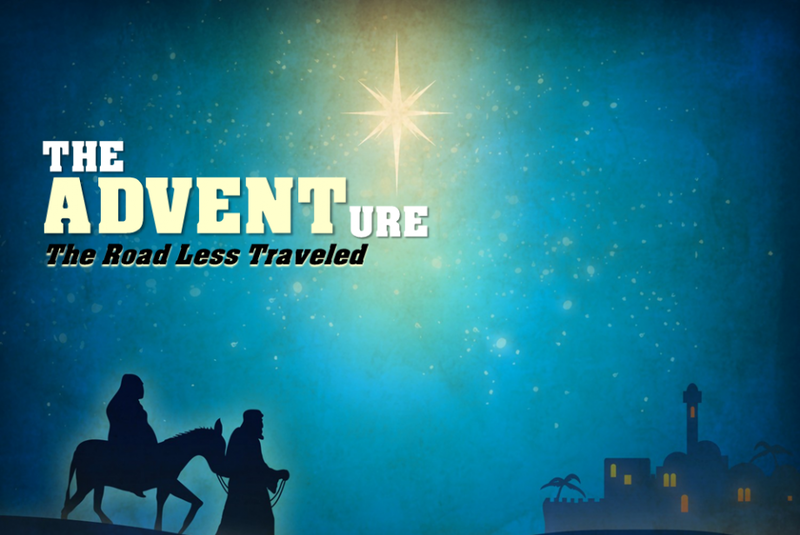 In this Christmas story, we not only see the Advent of Christ but the Adventure of those who are involved in His Advent. In this series, we will be looking at the five primary characters of the Christmas story as contained in the Gospels. First the young couple, Mary and Joseph, and the angel, next, the journey from Nazareth to the Biblically significant city of Bethlehem, following this, we will look at the outcasts who make the short but important journey from Jerusalem to Bethlehem to encourage the young couple. Fourthly, we will investigate the amazing provisions provided by God through the Magi from the East. Then on Christmas morning, we will light the Christ candle as we recognize the testimonies of Simeon and Anna in the Temple in Jerusalem. The Journey for Jesus begins in heaven and ends in Jerusalem as He ascends into heaven again. This is truly an adventure and is a picture of our spiritual walk in that God has called us on an adventure also. The things we learn from this classic Christmas story can be applied to our faith journeys in life as well.